This year, NASEP’s annual conference will be held at Seattle University, and is hosted by Prof. Wai-Shun Hung. While the “phenomenological movement” is to be counted among the 20th century’s most influential traditions of thought, its roots lie in the late 19th century’s debates and discussions on both the nature and foundation of logic, psychology, and ontology, and of their mutual relations. This can be easily surmised by skimming the titles of the articles found in the Jahrbuch. During the early years of the phenomenological movement, many of Husserl’s students also studied with the psychologist G.E. Müller and the mathematician David Hilbert. Though Richard Courant refers to this time period as “Hilbert’s Göttingen”, it might be more accurately referred to as Hilbert-Husserl’s Göttingen. For there existed in Göttingen a cross section of interdisciplinary research that fueled discussions within both the Philosophische and Mathematische Gesellschaften, informed the work carried out in Müller’s experimental psychology laboratory, and which drew students from across Europe to Göttingen. Similar conceptual partnerships informed the phenomenological philosophy of the Munich Circle, as well as the projects of the Graz, Berlin, and Lwów–Warsaw Schools. 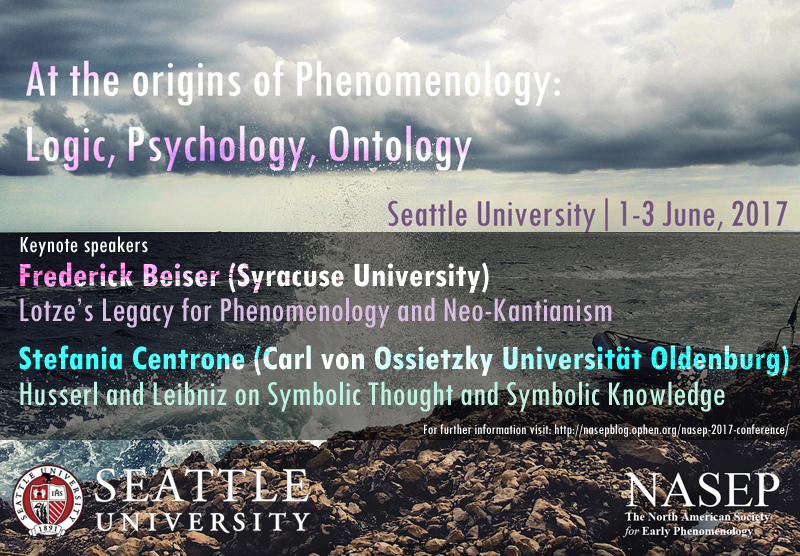 The theme of this conference will be the role and position of phenomenology within the development of logic, psychology, and ontology, as well as its contributions to addressing, and eventually clarifying those disciplines. Click here for the up-to-date conference schedule. Click here to see the full conference program, with abstracts for the talks. The conference will begin in Pigott Building Room 103, with opening remarks and the keynote address of Dr. Beiser. Regular sessions will take place in Student Center Room 130A/B. Dr. Centrone’s keynote address will be held in Engineering Building Wycoff Auditorium. For those looking for premium accommodations located adjacent to campus, there is a conference rate for NASEP attendees at the Silver Cloud Hotel Seattle – Broadway. 1. On the left hand side of the screen please select the desired arrival and departure dates and input the number of guests. 3. Click on “Reserve” for the room type you prefer. It will take you to a page where guests can enter all their information. 4. Finally, Click on “Make a Reservation” and your guests should receive a reservation confirmation email shortly thereafter. Call our hotel directly at (206)325.1400 and ask for the “North American Society for Early Phenomenology” or “NASEP” group and a guest services agent will be able to assist with making your reservation.